Dog’s are part of our family and as such when the temperature drops we worry that they might get cold, especially at night. One solution to this is to purchase a heated dog’s bed, but with so many different types and styles available, how do you know where to start? Our panel of pet lovers and dog experts have compiled a list of the 5 best heated dog beds to get you started. The Self-Warming Lounge Sleeper Pet Bed by K&H Pet Products is a unique way to keep your dog warm and comfortable throughout the night. It is even made from two layers of fabric. Plus, the first captures heat from your dog, acting as insulation, while the second layer reflects that heat back to your dog while they relax on the bed. The bed itself is stuffed with polyfill made from recycled bottles and is covered in plush microfleece. Additionally, the bolsters that surround the sides of the bed provide an added sense of security for your pet pooch. The lower front bolster makes it easy for even older dogs to enter and exit the bed, while the non-slip base ensures it stays still. Finally, the whole bed is machine washable and tumble dryer safe. If you want to provide instant and consistent heat for your dog while they relax on their bed, then the Thermo-Snuggly Sleeper Heated Pet Bed by K&H Pet Products may be what you are looking for. The bed contains a 6-watt removable MET listed heater that heats the bed to your dog’s normal body temperature when they are in it and maintains a low level of heat when they are not in the bed. Finally, the bed is surrounded by 2” thick foam walls, providing your pet pooch with a sense of safety and security and the exterior cover and pillow sleeping surface are removable and machine washable. This is the ideal bed for pets who spend time outside of the main home. The Lectro-Soft Outdoor Heated Bed by K&H Pet Products is thermostatically controlled using a low wattage heater and comes complete with a steel wrapped cord to ensure your dog’s safety. The durable mat is made from orthopedic foam covered in a waterproof PVC. It comes complete with a washable soft fleece cover to ensure your dog’s comfort at all times. The Petmate Aspen Pet Self Warming Beds use the same technology found in space blankets to heat your dog’s bed. It is lined with a layer of material that reflects your dog’s own body heat back to them. The foam filled bed has raised walls to provide a secure and comfortable experience and is lined with faux lambs wool plush for added comfort. The non-skid bottom ensures that the bed does not move when your dog is entering or exiting it, adding to its safety and appeal. If your dog has a dogloo or indigo house, then the Lectro-Soft Igloo Style Heated Dog Bed by K&H Pet Products is the perfect addition to that house. The half moon shaped dog bed is specifically designed to fit in and cover half the floor surface of such houses, giving your dog warmth when required, but also space to move off the bed if they want to. The bed is made from orthopedic foam, with a soft, waterproof PVC exterior. It is heated using a thermostatically controlled heater, so it never exceeds your dog’s normal body temperature. 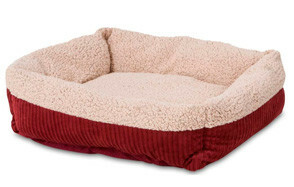 The bed also has a removable and washable fleece cover to add to your dog’s comfort. There are of course numerous ways to keep your dog warm at night, from blankets to having them in your bed. But, there are disadvantages to many of them, including the risk of your dog overheating. A high quality heated dog bed reduces this risk and many others. In this part of the buying guide we look at the key benefits of a heated dog bed, the factors you should consider when buying one and other questions that such beds may raise. Arthritis can be extremely painful for humans and pets alike. It is a joint disease that can either inflammatory or non-inflammatory. Symptoms of the former include swelling (inflammation) and joint pain. Symptoms of non-inflammatory joint disease include degeneration of the joints, pain, and stiffness. A heated dog bed can help to soothe your dog’s stiff joints and loosen tight muscles. A high quality heated bed that includes and orthopedic base can also provide support for the whole body, giving a more comfortable sleep. Hip dysplasia occurs when your dog’s ball and socket joint in the hip does not fit together properly. When this happens, the ball can slip from the socket causing wear and tear on the joint above what normally occurs as part of the aging process. This causes difficulty walking and standing and results in increased amounts of pain for your pooch. The heat generated from a heated dog bed can help to relieve the stiffness and pain associated with the condition. When combined with an orthopedic pillow or base, a heated bed can support dogs that have medical problems with their spines or have undergone a spinal injury. Heat helps to stop the muscles that support the spin from contracting and spasming, making movement easier and reducing pain and difficulty moving. A heated bed can improve circulation and improve flexibility, which can support senior dogs and help them to stay more mobile, reducing the risk of injuries and age-related joint conditions. 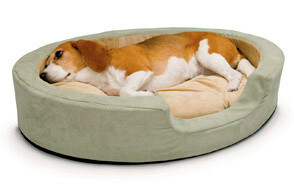 The type of heated dog bed you choose depends on the main reason for needing the bed and where it will be placed. A dog with one of the medical conditions considered previously will have different needs to one that needs a little extra warmth in their kennel. However, there are some key features to look for that help you to make the right decision for your pet regardless of the main reason for the purchase. As with any dog bed, you need to ensure it is the right size for your four-legged friend. If it is too small, then your dog is not going to be comfortable and is unlikely to use the bed. However, if it is too big, then they may not get the full benefit of the heat. This is particularly true of beds that self-warm as they only reflect back the heat your dog creates. Heated dog beds are generally either self-warming or use a low wattage heater to create the right temperature for your dog. There are many benefits to both, however, if you are choosing one with a heater, ensure that it is thermostatically controlled so that your dog does not overheat. Thermostats are only one safety feature to look for in heated beds that include a heater. Heaters should be thoroughly tested and reach the required safety standards for use in a pet bed. Also, check that the cable is chew-resistant and that the heater is covered with a waterproof cover to avoid moisture getting into the heating element. All the materials included in the bed should also be fire retardant. This is particularly important for dogs with mobility issues. Having the bed move as they step in or out of it could cause additional pain and increase the risk of accidents. Keeping your heated dog bed clean is important, especially if it is used outside in kennels or sheds. Look for a complete machine washable bed or one that has removable and washable covers. For those with heating elements, the waterproof cover should be wipe clean and covered with a washable soft cover. While heated dog beds come in a range of shapes and sizes, they can be separated into two main types – self-warming and those that use electricity to heat the bed. Here we look at both types in a little more detail. Self-warming beds use your dog’s own body heat to create a warm bed. Instead of your dog’s body heat simply being absorbed into the bed as would usually happen, in these beds, the heat is reflected back to your dog. This is achieved by using special materials that work in much the same way as space or survival blankets. These beds are great because they do not use electricity. There is no additional cost for keeping your dog warm and no need to place near an electrical outlet. It also means there are no leads and no risk of your dog chewing through the lead or through to the heating element below. However, self-warming beds rely on your dog being in them to produce heat, so when they leave the bed they cool down quickly. It also means that if your dog is having difficulty maintaining their body heat, the bed will not produce as much heat. This makes them unsuitable for use outdoors or in kennels. These beds include an electric heater in the base of the bed, which produces heat to warm the bed. The best electric heated dog beds are thermostatically controlled so they cannot overheat. The thermostat allows you to maintain the bed at your dog’s usually body temperature. Some can also be set to maintain a lower temperature when your dog is not present so that your dog can return to a warm bed without it costing a fortune in power usage. Such beds can come as either full pet beds with cushions and bolstered sides or as sleep pads. While the full beds are usually intended for indoor use only, the mats can often be used outdoors, in kennels, dog houses, or sheds, as well. However, it is important to check with the manufacturer before using any heated pet bed outdoors. 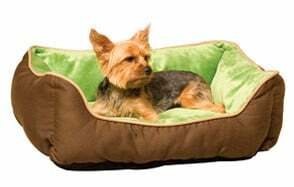 The key things to consider with electrically heated pet beds are the safety features, including ensuring that the heater is MET safety listed and that the cable is chew proof. Electrically heated beds are not suitable for pets who have a tendency to destroy their beds or other furniture as there is always the risk that they will chew through to the electrical element. Q: What are Heated Dog Beds? A: A heated dog bed is one that either self-warms through the use of special heat reflective materials or includes an electric heater to provide additional warmth for your dog. Such beds come in a range of styles from full lounge sleepers to sleep mats. Q: Why Buy a Heated Dog Bed? A: Heated dog beds help your dog to maintain optimal body temperature regardless of the air temperature. This gives them a more restful and comfortable sleep and reduces the risk of them catching a chill and becoming susceptible to other illnesses. Heated dog beds can also help to reduce the pain and suffering of a range of joint and back conditions including, arthritis, hip dysplasia, and spinal problems. They can also provide support for senior dogs who may have more stiffness and joint pain than their younger health counterparts.